We fit contact lenses for myopia, hypermetropia, astigmatism, and presbyopia. We are committed to ensuring that you get the proper fit, even if that means trying on lenses repeatedly. Your lenses must provide good vision, be very comfortable, and respect your eye health. Contact lenses must be considered health products. Our clinic carries most of the contact lenses on the market. These lenses increasingly respond to all the needs of contact-lens wearers, whether for daily, occasional, or 30-day use. You dispose of these lenses after wearing them for a day or even after just a few hours if you decide to take them out. One-day contact lenses are ideal for travel, camping, sports, and leisure activities or whenever you would rather not wear your eyeglasses. Silicone-hydrogel contact lenses represent a breakthrough in contact-lens technology. In fact, silicone hydrogel transmits more oxygen to your eye, so that it can breathe better and stay healthy. Most of these contact lenses have a moisturizing factor, which improves comfort for people with dry eyes. The lenses are designed to be worn for two or four weeks. Whether for astigmatism, presbyopia, or corneas with unusual curvature, the broad variety of lenses on the market allows us to meet your specific vision needs. These lenses offer the best vision for some people. This package, which includes a one-year supply of disposable contact lenses and solutions, is an economical way to get your contact lenses. We have on-hand a selection of more than 1400 frames for men, women, teenagers, and children of all kinds of brands, including Oakley, Silhouette, D&G, Brendel, Humphrey’s, Harley-Davidson, Gant, Tommy Hilfiger, Versace, Vogue, Vanni, DKNY, Mexx, Nike, Adidas, Guess, Easy Clip, Armani Exchange, and Inface. We also carry a broad selection of brands of children's frames such as Bratz, Youpi!, Batman, Spiderman, Ray-Ban, Jelly Bean, Jungle Eyewear, and Disney. We update our stock of frames on a regular basis to keep pace with fashion trends and to ensure that you can always choose from a varied selection of shapes, colors, and styles. We not only provide advice about frames: we can also help you choose the lens best suited for your lifestyle. Whether for work, reading, using a computer screen, sports, sunlight protection, or nighttime driving, we can recommend the type of lens best suited to your vision from our large range of ophthalmic lenses (high-resolution, no-glare, scratch resistant, for use with computers, and so on). We work in collaboration with Essilor to ensure that you get ophthalmic lenses of irreproachable quality. Essilor is also recognized for its broad diversity of ophthalmic products. We offer High Resolution Vision™ (Varilux® 360) lenses for presbyopic patients and Essilor SV 360º™ lenses for non-presbyopic patients as well as the easy-to-clean Crizal® Forte no-glare coating, an exclusive innovation. Ipseo® lenses adjust to the visual habits of the wearer for perfectly natural vision. The lenses adjust quickly for a unique level of comfort. A number of Ipseo® versions have been developed so far, with Varilux Ipseo New Edition being the fourth. We are an authorized Oakley dealer. This collection is prescription-ready. In addition, different lens tints are available for various conditions of sunlight or to enhance contrast. 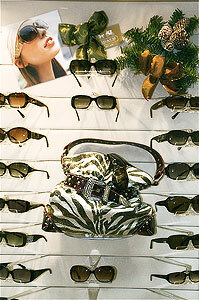 We also carry several other brands of sunglasses, such as Coach, Ray Ban, Serengeti, Versace, Anne Klein and Guess. The sixth generation of Transitions® is also gaining in popularity. No need to change your glasses each time you go in or out. The lens quickly darkens in reaction to sunlight when you go out and gradually becomes clear when you come back in. And, naturally, all our tinted ophthalmic lenses come with ultraviolet protection. Enjoy comfort and clear vision when you practise your sport. We offer prescription swim goggles and sports eyewear. Protect your eyes with safety eyeglasses adjusted to your vision needs. We carry a broad choice of CSA-approved frames. We can take care of all your needs if your employer requires you to wear safety glasses, including frames appropriate for your work environment, measurement, ordering, delivery, and eyeglass fitting. And remember to protect your eyes when working around the house.